Fireworks are OK in Derry by state statute; a phantom local ordinance accepted for years carries no legal weight. DERRY – Thanks to a newly discovered wrinkle in the town's ordinance book under the “fireworks” section, residents can assert their independence with fireworks this year, on a technicality. “The police have been operating under the assumption it's illegal to possess and use fireworks. It seems that may not be the case. I don't know what the penalties were for those caught with fireworks, but likely they had to do with fines, not criminal consequences,” said Councilor Neil Wetherbee. A phantom ordinance was cited by police and fire officials during the last regular Town Council meeting as the catalyst for requesting that the current council vote to ban fireworks. The council voted to table the matter, pending further discussion. According to Capt. Vern Thomas, such an ordinance was passed by a sitting council “sometime in the 1980s.” However, police were unable to find record of the meeting minutes where the vote was taken. That said, if it doesn't exist on paper, it doesn't exist, said resident Mike Gill, who objects to police persistence in reinforcing such an ordinance. He says the state law, which allows certain Class B consumer fireworks within outlined parameters, is comprehensive enough to protect residents of Derry from those who might shoot fireworks in a congested area, or too close to a building. “I am opposed to the town of Derry spending my tax dollars for what I consider a nuisance ordinance, or silly attacks on my personal freedoms when this is something already covered under a state RSA,” said Gill. He further questions that an ordinance ever did exist in town. Wetherbee said he is in favor of taking a look at how the town might otherwise control the display of fireworks without an outright ban, as other municipalities do. “I had an e-mail from a resident who suggested we look at a permitting process, which makes a lot of sense to me,” Wetherbee said..
Chief Ed Garone said last week that the ordinance presented to council for approval was prompted by the annual confusion in town over fireworks. “The only time I permit fireworks is when a person has a pyrotechnic license,” Garone said. That position, without a written ordinance enacted by the town, carries no legal weight, said Councilor Kevin Coyle. State Fireworks Inspector Ken Walsh of the Divison of Fire Safety, said he's been fielding calls from several towns lately looking for clarification on how to enforce fireworks bans – or lift them – depending on the municipality. He said he was contacted several months ago by Derry officials, but has yet to receive an update on its ordinance. “Now I know why. It sounds like Derry needs to figure out what it wants to do, which by state law is whatever its governing body wants to do. Unless they vote otherwise, the restrictions on fireworks are limited to those restricted in the state – which include bottle rockets, firecrackers and certain sparklers,” Walsh said. “The only way we would change that is if town officials direct us to,” Walsh said. By the same logic, if town law enforcement officials believe there was at one time an ordinance voted on by the council, a letter of notification would have been required for state fire safety records, which may exist in state archives. “It would take some digging, but it would be interesting to see if we actually have such a letter dating back 20 years,” Walsh said. What's happened in those 20 years is that the fireworks industry has gone to great measures to make fireworks safe. Having three retailers in neighboring Londonderry – including two new superstores – makes banning them a harder sell to the public than perhaps it was two decades ago. 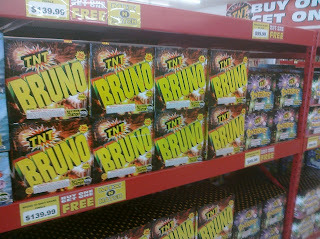 “The fireworks industry has worked hard to get away from the stigma that fireworks are dangerous. Now you can go into a retailer and buy a big box of fireworks that might display up to 36 different charges, all safely – really it's on the borderline of what a professional would use. But as with everything, if people follow the rules, use precautions, don't set them off while drunk, keep people a safe distance away, it remains a matter of personal responsibility,” Walsh said.